Well, it barely missed being in the stores for Halloween, but Moonstone's horror anthology VAMPIRES: Dracula and the Undead Legions, is now available for the holidays, should you know any classic vampire fans who've been avoiding the Twilight books. 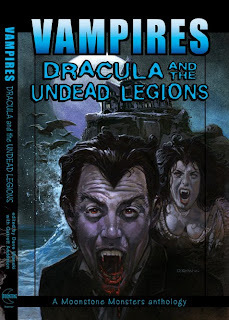 My short novella, The Evil of Dracula, is the lead feature, a prequel of sorts to Bram Stoker's novel, and follows my own past continuity for Count Dracula. Inspired very much by the Hammer Studios productions starring Peter Cushing and Sir Christopher Lee, it was their films that enchanted and fueled the fires of my imagination while I was still in my early teens. 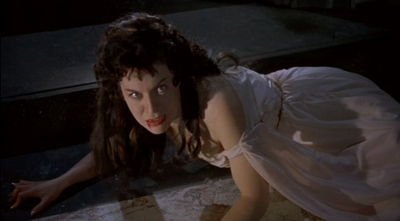 Hammer's Horror of Dracula is, I believe, the greatest vampire film ever made. 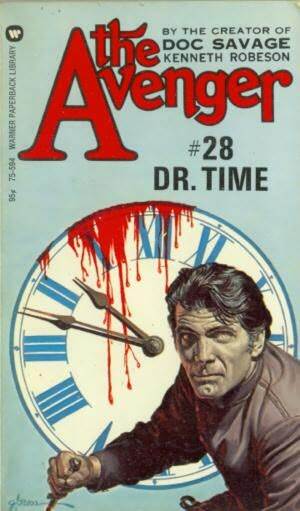 There are also terrific terror tales in this same volume by horror specialists L.A. Banks, P.N.Elrod, Elaine Bergstrom, and others. 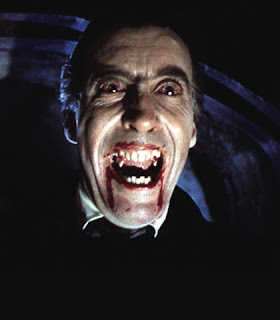 My story is, quite simply, a labor of love and has quickly become my own personal favorite of my many Dracula stories, and I hope that it whets your own appetite for the macabre. "O! She Doth Teach The Torches To Burn Bright"
I know what I'm thankful for. Several things, really. Last summer, as some of you may recall, Lisa went through major surgery. It was tough, nerve-wracking, and very scary. Neither of us knew what the ultimate outcome would be. Strange, perhaps, to say--but the experience made us closer. Somehow all that anxiety and fear helped create an even stronger bond. Now, all is well. Perhaps better than ever, because we know how fragile this reality is. Also, my writing career has continued to peak, which is extraordinary to me. The past few years have been such a whirlwind of book contracts and deadlines and more contracts, that I often feel I'm dreaming. And a fabulous dream it is. As reported here just last week, I recently completed a rather extravagant graphic novel translation of Shakespeare's MACBETH, which has been one of the highlights of my 22 year career. My editors, Donald Lemke and Michael Dahl, were apparently pleased enough with my job that they offered me my own choice of their three remaining planned Shakespearean plays. The posted picture should give more than a hint of my enthusiastic choice. Truth be told, I'm ecstatic. My father, who will be 85 years old in a couple weeks, calls me weekly from Kentucky, catching me up with all the family gossip. Mom passed away nine years ago this month, and I miss her terribly. There are so many things I wish I'd told her, and asked her. It's ironic, perhaps, that Dad and I are closer now than we ever were while I was growing up. He worked all the time back in those days and hardly ever said a word to me, but now we never seem to run out of things to talk about. He's also become one of the funniest guys I've ever known. I really should write this stuff down, one of these days. Perhaps I'll even use this blog as a testing ground. So, here we are with another Thanksgiving creeping up on us. As anyone can see, I've much to be thankful for. Hope all of you are as lucky as me. The news went through my boyhood neighborhood like a lightning bolt. Dozens of my fellow suburban urchins raced down cracked gum-dotted sidewalks, scurrying home to warm up their rabbit-eared television sets. Humid crackles of suspense hung in the air, like the thrill kids feel before a thunderstorm. 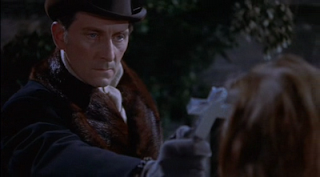 A special broadcast of Frankenstein, the one, the only, the great original, was on at eight ‘o clock! It was quite an event on our street, comparable—almost—to the Apollo Eleven Moon Landing a year later. That late summer Saturday evening, with the sun not yet set and the streets oddly empty of bicycles, everyone was glued to the tube ready to watch the greatest, and most famous, horror film ever made. Just imagine, being treated to Halloween, two months early. We were the luckiest kids alive. 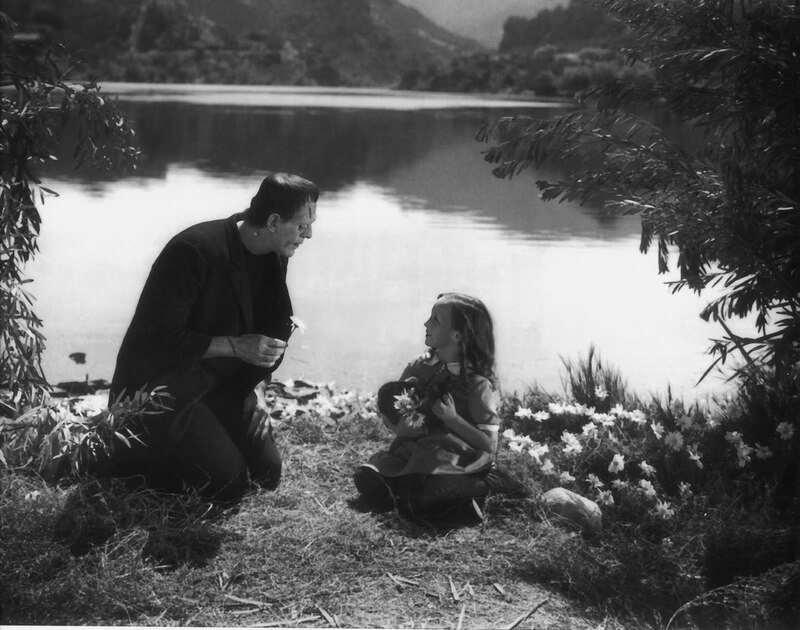 Mind you, even by that early age, I was already a seasoned Boris Karloff fan. He was the first "movie star" I ever remember recognizing, and my older brothers have told me that I could pronounce his name at the age of three. I'd already knew much about him in treasured copies of Forrest J Ackerman's Famous Monsters of Filmland, rereading the magazines ragged. 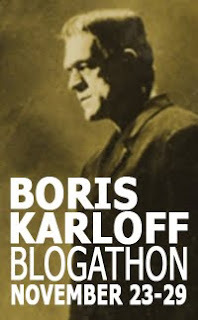 Besides the occasional monster movie on TV, his likeness kept me company in the form of an Aurora plastic model kit, I'd also seen Karloff on The Red Skelton Show, and his long-running Boris Karloff Tales of Mystery was one of the earliest comic books I actively collected. 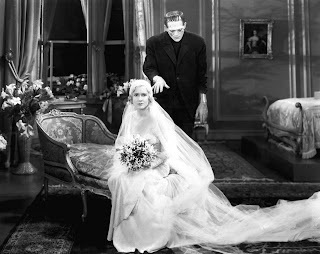 Karloff's masterpiece, Bride of Frankenstein, is the first of his many films in my memory. I must have been five years old, or younger, when I originally saw it and the experience has never left me. 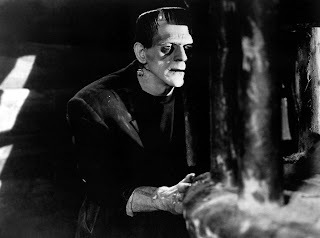 Somehow, I think I must have related to the poor lumbering beast that he so eloquently portrayed. At that age I must have felt just as alienated, inarticulate, and certainly as awkward around my much more athletic older brothers. Among other things, I wore orthopedic corrective shoes during that period that looked, and felt, like the Monster’s own heavy boots. Boris and I quietly understood each other. So, by the time the original Frankenstein appeared on our local TV stations, this was a very big deal for me. Apparently, for lots of others, too, as I was to happily find out. 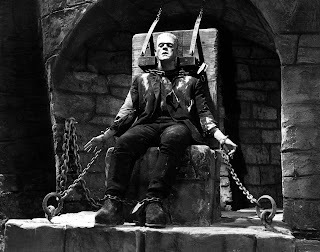 I had been cordially invited to join my next-door neighbors for the movie, three sisters close to my age, so that we could watch Frankenstein on their new color TV, the first such contraption in the neighborhood. I tried in vain to explain to the girls that the movie wouldn’t be in color no matter how much their dad paid for the set. There didn't seem to be any disappointment, though, when the grainy old black and white print began to run. I’ll never forget Boris Karloff’s classic grand entrance in the film, backing through the darkened doorway and turning slowly to reveal Jack Pierce’s iconic Monster makeup in a startling series of rapid-fire close-ups. Making the scene even more memorable was the ear-splitting scream suddenly shrieked by Pam, the seven year old sister. 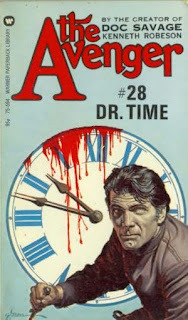 She finally calmed down during the next commercial, but when the Monster reappeared it was bloody murder all over again. At that point her mother promptly ordered the girl to bed. Pam’s older sisters, their mother, and I finished watching the film, mesmerized. As the ending credits rolled we heard a soft whimpering from the hallway, only to discover Pam crying her eyes out at the fiery demise of the Monster. Scared as she was of him, there was still room in Pam’s heart to feel sorry for the anguished, unwanted creature. For years afterward, Pam would ardently insist that she frequently heard “Frankenstein, after midnight, stomping down the street." A spooky notion that she appeared to truly believe, but I could tell that it brought some welcomed magic and mystery into her life. Where ever she is now, probably a mother herself, I wonder if she still hears the echo of those giant footsteps outside her window? I wonder if her own children are lucky enough to hear them, too? 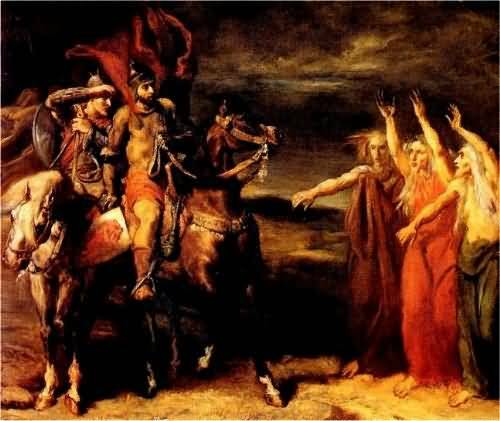 After two straight weeks, and seventeen hour work days, my graphic novel translation of Shakespeare's MACBETH is complete and now is in the hands of my editor. Despite my opening remarks, this was actually one of the most challenging, and creatively satisfying projects I've ever composed. 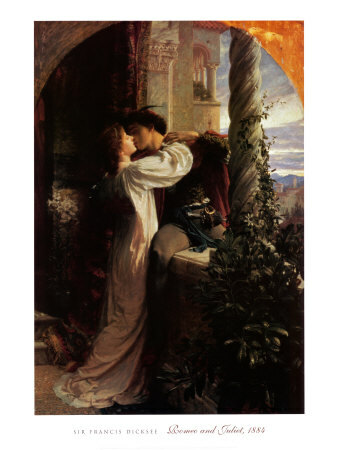 I'm looking forward to more collaborations with the Bard someday. The Greatest Crime-fighter of the 1940s returns, and Moonstone has got him! I've been so swamped these past several weeks that I haven't had the chance to announce this new project, which is sort of a shame as pulp hero Richard Henry Benson, alias "The Avenger", is one of my very favorite characters. 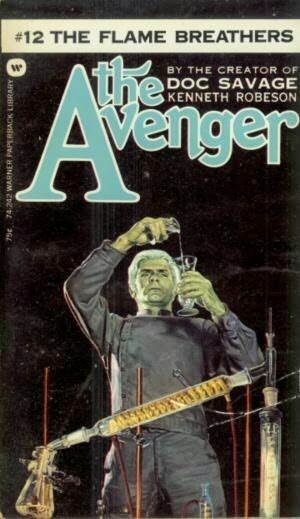 Arguably, I believe that the original Avenger novels, written by Paul Ernst (under the house-name of "Kenneth Robeson") are the very best written of all the hero pulps. On a personal level, don't know if I could have made it through my dreadful high school years without having Benson and his fearless crew there to rescue me. 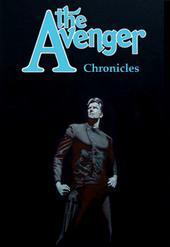 Happily, this will be my second reunion with the character in print, having contributed my short story, "The Devil's Mouthpiece", to Moonstone's The Avenger Chronicles prose anthology last year. That was, quite seriously, one of the greatest highlights of my professional writing career. 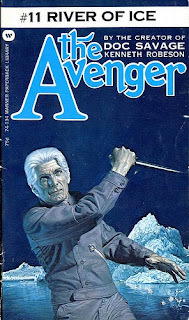 As with the former collection, both future volumes (that's right--two new Avenger books!) will be edited by Joe Gentile and Avenger scholar Howard Hopkins. 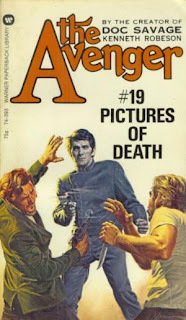 I'm in very good company with a whole swarm of excellent pulpsmiths on the team. I'll post the author's list soon as it's finalized. So, here we go again! Getting to be "Kenneth Robeson" once more is a genuine dream come true! Far as the pulps are concerned, it just doesn't get better than this!